The Lake Oswego Womenn's Coalition will meet March 20 at The Stafford. Their program will be presented by Kordell and Patty Blair, owners of Kordell's Garden Center. The Lake Oswego Women's Coalition will gather for a meeting March 20 at The Stafford, 1200 Overlook Drive in Lake Oswego. Guest speakers will be Kordell and Patty Blair, owners of Kordell's Garden Center on Rosemont Road in Lake Oswego. They will give information on spring gardening trends and also a bit of their history in building the now 20+ year old business. Patty was born and raised in the Willamette Valley. Kordell was born and raised in Alaska, and got his first job working at a fruit stand in Alaska during summers. He came to Oregon to attend Oregon State University. After college, Kordell went to work at Palisades Market in Lake Oswego. "(It was a) great experience, learning the ins and outs of the retail trade," he said. He managed the produce department at numerous stores. "I learned a lot about the local produce market and where and from whom to access the best fruit and veggies." In 1997, the opportunity came along to open his own produce stand on Rosemont Road. He rented a small space from the owner of the garden center for the first five years. "When the owners were ready to retire, my best friend — and now my wife, Patty — and I decided to take the plunge into a retail garden center," he said. 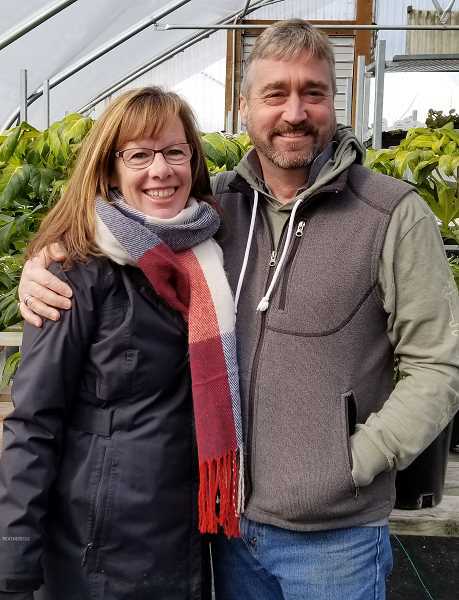 "Thank goodness she had retail and wholesale nursery stock experience as well as her training through the Clackamas Community College horticulture program, because it was a 'learn on the job' experience for me." In year 21, Kordell's Garden Center now encompasses nearly four acres full of quality plant material. The Blairs have eight full time employees, paying health insurance and offer an IRA program with an employer match. They add up to 10 part-time employees during the spring and summer months, and rent the seasonal fruit stand to Parsons Farms mid-May through September. "Our basic business plan is to have the best quality plants with a focus on locally sourced plants and produce," he said. "We believe the closer to home a product comes from, the better off we all are. Not only do locally grown plants perform better, and local produce tastes better, they support our local economy." All are welcome to attend the luncheon meeting, which starts at 11:30 a.m. with networking. Lunch is served at noon and the program begins at 12:30 p.m., concluding by 1:15 p.m. Cost for the lunch is $18 for members and $22 for non-members. Reservations can be made by calling 503-638-1589.